It strikes me sometimes that the triplets are never in a gang, either together or of their own, friends.They don't even share the same friends at times unlike Mary-Lou's gang etc. Given EBD's liking for groups of friends, often led by one girl, this seems to me a little strange. I think if any of the triplets was likely to lead a gang, it would be Margot. Len doesn't have that kind of personality, and it's not something Con would be bothered about. But EBD chose instead to give Margot the exclusive friendship with Emerence. Just as well, really; I think the school could do very well without a gang led by Margot Maynard. I think it would tend to bring out her worst qualities. All the Russell girls' ages get EBDed, don't they, as does Maeve's. Ailie should be the same age as Jack Lambert - within the same month, I think - but ends up in the form above. And there's no suggestion Ailie is especially advanced. Maeve is, or should be, around two years older than Josette, but is HG after her. It would have been better if the triplets had a proper mixture of friends instead of a succession of very similar new girls, most of whom Len initially takes under her wing. Though when I was the proper age for the books, I quite liked the sequence of books when the triplets were aged 13-14. I like the Inter V/Vb books, but the girls end up seeming very fickle, which I'm sure isn't what EBD intended . First Len is friends with Ros, then she's friends with Ricki and Odette, then she's back with Ros and they're both friends with Ted, and Ricki is friends with Con, and then Ricki's friend Sue arrives ... . The Len-Prunella friendship just fades out, and so does Prunella. A lot of the One Book Heroines - Stacie, Gillian and Joyce, Tom, Carola, Katharine, Jo Scott - play some sort of ongoing role - and the ones who don't are mainly the people from the wartime books where there are big gaps in the series, but Prunella fades away. EBD even forgets her name, and refers to her as Prunella Davies rather than Davidson in the later books. EBD makes a very big deal about how different the triplet's personalities are so perhaps they also gravitate towards very different people. A gang made up of the people Margot attracts v the people Len attracts would not necessarily gel together. And, while it's never mentioned, would Ted really be comfortable with Margot after the blackmailing incident? Maybe she tolerates her as Len's sister and a fellow prefect, but I imagine there would be awkwardness ever after. They must have been reasonably comfortable as Margot invites her as her guest at Half Term in Leader. Mind you, her two closest friends are going to be there: Len and Ros, so it may have been the reason behind the acceptance. However, it does show a certain amount of thoughtfulness on Margot's part to invite one of her sister's closest friends or the two had genuinely made peace with each other. I actually think Ruey and Leader do a very good job of showing Margot's reformation after the "Ted incidence" as you can see Margot's attempts to control her temper and think of others. It's very up and down, with it being weighted on the side of success rather than failures, but remains realistic in the process. I always wondered though how Margot managed to fall into the lake. She's sitting on the fence and Emerence bumps her and she falls in which means the fence is right NEXT to the water. Wouldn't there be a grass area or another kind of barrier between fence and water? I suppose she could have fallen to the ground and rolled in but EBD writes it as if the water is smack bang against the fence. Am I the only person here who really likes Prunella? I love the way she talks and the shock and awe she causes. No, I really like Prunella too, and always regret that we see so little of her after this book. About Margot falling in, I doubt we'll ever know exactly. Railings by water in much-visited places do often seem to be as close to the edge as possible, presumably to allow a good view but minimise the likelihood of accidents. The Quai National appears to me not to have any railings in the present day, and in fact, is not absolutely next to the water, though it's very close. And it's definitely a railing, not a fence (nor a balustrade as the original cover and illustration show), and if Margot could swing herself up and sit there, it may well have had a flat top that Prunella could dive from - but I agree it may be stretching things a bit! I was going to hunt for a similar picture abbeybufo, since I can remember hanging over such railings as a child at Lake Maggiore - and lo, here they are! No problem to tip over them though I am not sure about diving off them to rescue someone. I too have always liked Prunella, and love the language thing. 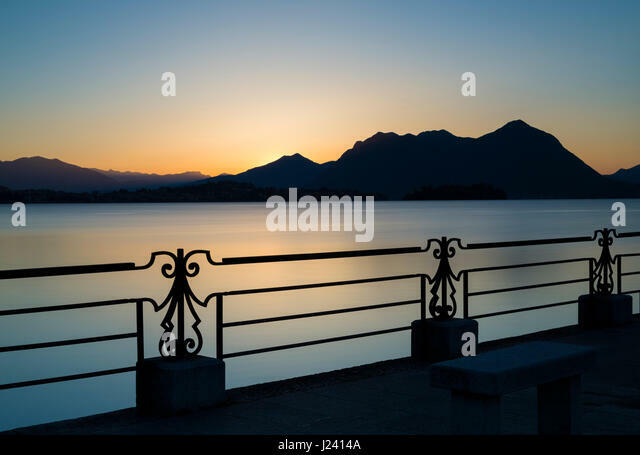 They still have railings like that at Lake Maggiore . I was there last year. You could soon climb over them, but I think you'd have to have extremely small feet to be able to dive off them! Another Prunella fan here, not really sure why except that I've always been fascinated by names, and not only do I like her name, but I enjoyed her scheme of calling everyone by their full names! I also liked the way she tried to get her own back on her parents by being the opposite of the daughter they had sent to school. That was so like the way I would have reacted in her shoes that she appealed to me at once. I enjoyed the way her friendship developed with Len, and it remains one of the books I love to re-read the most often. It's one I re-read too, possibly because it was the only CS book in the local junior library so I read it at the right age rather than most of the Swiss books which I read as an adult (the library also had one EJO- Adventure for two, and one DFB - The Bees on Drumwhinnie) I like Prunella and I wish she'd appeared more in the later books. Last edited by ivohenry on 16 Sep 2018, 21:37, edited 1 time in total. They must have been reasonably comfortable as Margot invites her as her guest at Half Term in Leader. Mind you, her two closest friends are going to be there: Len and Ros, so it may have been the reason behind the acceptance. They are allowed to invite one friend each and, as Emmy has left, Margot has no close friend left. So she invites Ted as Len had already invited Ros. I agree however, it shows a thoughtfulness on her part to invite someone she knows her sister would like to have with them. And it also means Ted doesn't get left out. Gorgeous pics, thanks! I can see how Margot could fall in if Emmy bumped her but not how Prunella could have dived in. I think she must have dived from the top of the railing rather than the side. I don't think that a Gang would have worked in the triplet's year. Mary-Lou and Jack are both dominant personalities who form a gang around them, and they are both the most important girl in their year, from a story perspective. And there are other groups, like Bride and Tom's year, where there isn't a defined Gang, and also not a single most important character in the year. So with the first two, new girl stories tend to involve the Gang, which can absorb new members as needed. And in the latter, multiple characters can share the new girl stories. With the triplets, they're definitely the most important girls in their year, so they need to be central in any new girl plot. But none of them are really Gang leader material. Margot has her pair with Emerence, and keeps shifting forms, so she's generally not with the same girls for more than two terms in a row, which would make friendships in general difficult. Con's a loner, and while Len is a responsible girl, she's not really a leader type. And the age has an impact too - it would take a very strong personality to be the social leader in a form where you're two years younger than most of the other girls. So if you combine the above, you get a series of short-lived friendships that last a book and then fade off again. You don't get Len forming a gang around her as she adds new friends to her group, and you don't get a book where the central new girl forms a strong friendship with someone other than the triplets, and the triplets are off to the side for the story. The triplets' year is weird in other ways, too - you've got a whole batch of girls who start out with Mary-Lou and end up with the triplets (the Dawbarns, Primrose, Heather, Emerence, Betty, Alicia, etc), and then a whole bunch of them spend three years in the sixth form. In EBD's mind, the triplets were first and foremost Joey's daughters and that affected her writing of them. It also affected her writing of everyone else in the school at that time. Even Jack Lambert was not entirely her own person but had to be connected to Len. Another Prunella fan here, not really sure why except that I've always been fascinated by names, and not only do I like her name, but I enjoyed her scheme of calling everyone by their full names! Yes, that was clever - for most people it's annoying, or at least irritating, to be called an unfamiliar version of your name - and as we know, the CS girls did go out of their way to shorten names - and some of us more pedantic folk get irritated too, especially when it's the wrong 'full name'. I had a senior colleague who insisted on calling a member of our team 'Christopher' rather than 'Chris', but it was actually Chris-short-for-Christian. I've never come across Sue as an independent name, but I expect EMBD had - and given the independent existence of e g Molly, Sally etc it's unsurprising. Just on a different tack, what about Biddy's romance? She's the first CS mistress, other than Simone and that was due to the particular circumstances of the war, to carry on teaching after she marries (a few books later) - although she inevitably becomes "busy" with twins soon afterwards, and leaves then. She's also one of the very few characters to marry someone of a different nationality/cultural background (and he's also one of the very few Swiss characters in the Swiss books). She starts off as the impoverished orphan who's rather bizarrely adopted by the school Guides, and she ends up doing it all - Oxford, travelling, teaching, marrying a doctor, having twins. I do wonder if EBD deliberately copied the name of the hero of The First Violin (well, the name he went under, his real name being Eugen von Rothenfels, another surname used by EBD ), but I think she probably just thought the name sounded good and forgot that she'd actually read it in a book . I also like Prunella and I can identify with her rebellion, although I don’t think that I could have kept it up as long as she did. Having a name that people constantly mangle, I agree with Len blowing up. I would probably not have apologized, and I’m not likely to have felt the guilt Len did. When I was confirmed, I corrected the Archbishop’s pronunciation of my name to the extreme horror of my mother and the nuns who were within hearing range. Before the ceremony, they wanted me to use a “simpler” name, and I refused, and replaced my name tag to keep my own name. I think Emerence is acknowledged as being older, but is she one of those girls who's kept back a form or two because her work is subpar? Like Joan? ETA: and I hate being called Charlotte! It's on my birth certificate as Lotte isn't a proper name in the UK, but my family never call me that.